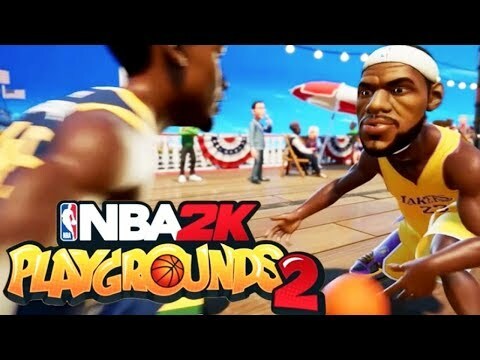 A dynamic NBA arcade game is back, becoming even better in NBA 2K Playgrounds 2! The continuation of the original hit takes street basketball to a new level thanks to the large number of existing and former NBA players, an improved selection mechanism for opponents on dedicated servers, online matches for four players, three-point shots, new grounds, user matches and much more! Gather your team and forward to the game without limits! ▪ Stunning game modes. Bring street basketball to a new level thanks to various additions, including the new season and championship modes! Play 2 on 2 with friends on the local network, in online matches for four players, or compete with your opponent in a three-point shooter contest. ▪ Expanded Team. Collect more than 400 NBA players, including the greatest basketball players of all time, like Michael Jordan, Kobe Bryant and Dr. Jay, as well as modern stars such as Carl-Anthony Townes, Jason Tatum and Ben Simmons. New player models and new corona tricks animations. ▪ Brand new venues. Show your skills on 10 new venues around the world. Score balls under the California sun, make passes in the bright lights of Seoul or circle an opponent in the Australian outback. Processor: Intel core i3 CPU 530 2.93GHz or better. Graphics: GeForce GT 630 or better.